Los Angeles is the second-largest school district in the United States. Its teachers have been working without a contract since July 2017. A teacher’s strike might be imminent. Negotiations are at a fever pitch, now in mediation. As with strikes across America in places as vastly different as Oklahoma, West Virginia, and Chicago, UTLA, or the United Teachers of Los Angeles, while demanding higher pay, are also demanding more investment in schools, smaller class sizes in all schools, hiring full-time support staff like nurses, and more. There are sticking points like allowing what are called ‘low-performing’ teachers to be dismissed, and battling over how teachers are to be evaluated. The press makes it seem like, unlike Chicago, that parents and teachers are not unified with many parents opposed to the idea of a strike. We’ll talk about that. Then there’s the fiscal future of the schools, that appears to be headed for huge deficits. Not so much from cuts in school budgets, it seems, but cuts in state corporate and wealth taxes, lessening the money for schools. Unions are battling for their existence, and teachers are fighting for their students and schools, and governments and school boards want cuts and compliance from teachers. 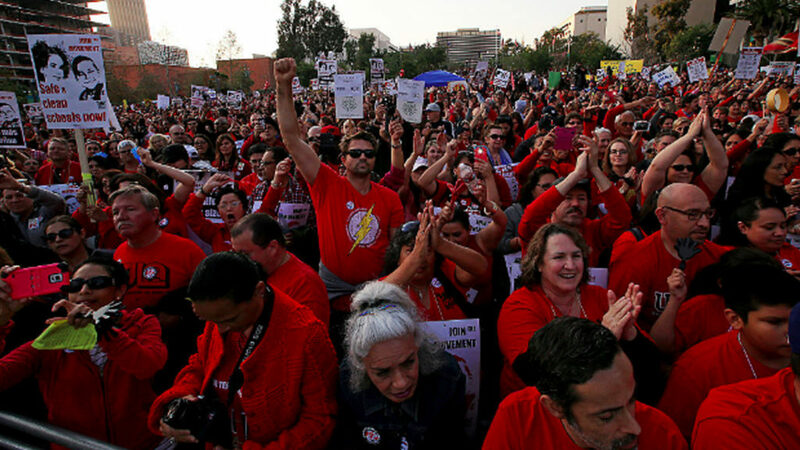 To help us parse through all of this, we talk with Arlene Inouye, who is the head of the United Teachers of Los Angeles bargaining unit, and Secretary of the Union. And Arlene, welcome. Good to have you with us. ARLENE INOUYE: Thank you so much. MARC STEINER: So let’s begin with some history here. This is a huge district, a very complex district, both in terms of class and race. And so what is the history of why there’s been no union contract since late last summer? ARLENE INOUYE: Well, we’ve been in bargaining for 18 months. And we are, like you said, a large union. We’re a diverse union. We are comprised of K-12 teachers, adult educators, early educators, substitutes, but also about 60 different subgroups of health and human services professionals. So we represent the nurses, the counselors, the speech therapists, and so forth. Librarians. So we have been in- we’ve gotten a lot of input from all of these groups, and we brought it to the table. And we are basically looking at two different visions for the school district, and we have been at a standstill. MARC STEINER: Let’s talk about those other different visions for the school district here. This is kind of critical to it. Let me ask a question I brought up during the introduction- and I really want to get to the heart of this. When you read the news, at least the news I’ve been reading coming out of California and Los Angeles, it appears, or made to appear in the press, that groups like Parents Revolution and other groups are opposed to the union strike, and there seems to be a gulf between teachers and parents unlike what happened in West Virginia, unlike what happened in Chicago. Can you talk to that a bit? ARLENE INOUYE: Yes, that’s absolutely false. The groups that you’re talking about, we call them astroturf parent groups. MARC STEINER: Astroturf? What does that mean? ARLENE INOUYE: Yes. That means they’re, like, not the real thing, right. They’re fake grass. And they’ve been brought together and in many instances paid, put on buses, given their propaganda materials, to make it seem like they are supportive of the school district and against the union. But let me tell you that we the educators, we the teachers, who interface with parents all the time, we know the parents are on our side. They want the same things we want. They want more counselors, a nurse at every school five days a week. They want better conditions for their children, which are our working conditions. So they may give the appearance and use that in the media that parents are on their side, but they actually kick out our parents, too, at these invitation-only events that that Buettner is holding across the city, our superintendent. So they are kicking out our people, and trying to promote their astroturf parent groups. MARC STEINER: So for full transparency, let’s just throw this out, because I think it’s important to talk about this. Many years back, I was the organizer for the teachers union here in Baltimore, where we’re broadcasting from. So I should put that there first, full transparency. But the other part I want to ask you about, though, continuing this, is that one of the, one of the arguments that I hear people make against teachers unions here, or Chicago, or Oklahoma, and in LA as well, has to do with low-performing teachers, has to do with teachers who are not cutting the mustard when it comes to taking care of our children. And that they say unions are always in the way of dealing with that, and not allowing the best teachers to move ahead. And I know this is- we can get into this in more depth in terms of the negotiations going on. But can we talk to that first? I mean, because this seems to be one of the public popular bogeymens that are thrown out around teachers unions across America, including what you’re facing in LA. Well, I think that it’s a real distraction in every profession. You are going to have those who are not performing well, or as high as they should. But in relation to education, we have been defunded for the past 40 years. We have had high class sizes in California; we’re 48th in the nation in class size. How can you expect a teacher who has double the number of students they should be having able to teach students in those conditions? So I want to flip that dialogue, saying look, what we need is to support and invest in public schools, and then let’s talk about the the issue of the teachers. MARC STEINER: So the class size I was shocked by, 48th in the nation. I read that earlier today when I was reading some articles about what was going on in Los Angeles. So the question, though, is what are we demanding here? What are the teachers union demanding here when it comes to this? Because there also, reality is that the schools seem to be facing a huge deficit coming up in the next couple of years. So how does that balance out? ARLENE INOUYE: OK. You say the schools are facing a huge deficit right. Then why does LAUSD have a $1.863 billion dollar general reserve that’s been higher than any other year that they choose not to use to invest in the schools, in our students, in our educators.? They choose to have a 25 percent general reserve when by law they only need to have a 1 percent reserve. Why is it that other school districts have a 2 or 3 or 4 percent reserve? And LA Unified continues to say we need to have extra money here, because we’re going bankrupt. We need to have more money for books and supplies, or certain categories that they frontload. And then at the end of the year, lo and behold, there’s a surplus. That’s what they want you to think, that there’s not enough money. But they need to invest in our schools, because unless they do, students will not be attracted to LAUSD. We will continue to lose students, as we have been, and educators will leave this district, because they have better conditions and better pay all over the place, all over surrounding LA Unified. So it’s an issue that we have, that we’re saying right now, address the $1.83 billion dollar reserve. MARC STEINER: So where did that money come from? How do they save $1.3 billion, and how would you suggest as a union, as a community, to spend it, and what to do with that money? ARLENE INOUYE: Well, we’re asking them to spend it on the proposals that we brought to the table. MARC STEINER: For example, by lowering class size. They say it will cost $200 million. That’s a great investment from that $1.83 billion. And when they lower class sizes they will also need more educators. That’s like 2000 more educators. And then there will be less classroom space available for charter schools through the colocation that is occurring right now. And that will, again, build up our schools instead of drain our schools. MARC STEINER: So the three things here I want toask you that you mentioned that we talked around. But let me begin by looking at the question of salaries, and what teachers make, what teachers are asking for. And then you add on the 2000 more teachers. Can you parse it out a bit more for us? ARLENE INOUYE: Yeah, and let me explain. What the issue for us with class size is not just having a number, lowering the number. It’s to take out Section 1.5 in Article 18 in our contract right now. And basically what that 1.5 states is that the district can claim an economic insecurity or economic insufficiency, and request to waive class sizes. And they do that every single year. And that is why they ignore any kind of class size maximums or caps, and they could just do what they want. And that’s the problem that we have, and we must have that taken out of our contract. And I don’t know any other school district that has a 1.5. But the district has been unwilling to address that issue. For us it’s essential for the quality of teaching. You talk about teachers. Well, if you want to have teachers, having a quality educational experience with them, then we must address 1.5. MARC STEINER: So again, that kind of begs the question of what happens long terms in terms in terms of investment in schools. I mean, is it a reality or not a reality that the way the state invests in schools cannot meet the demands for education and the future? Is that real? ARLENE INOUYE: We have definitely- we are 43rd in the nation or 44th in the nation in per pupil spending. So that tells you that California is at the bottom when we’re talking about public education. And yes, we need to invest more from the state. And we are actually working on that. In 2020 we have a bill that will go forth called Schools and Communities First Act, and it will address the corporate loopholes in Proposition 13 that was passed in 1978. And it will bring $5 billion back into education. Because you know, studies show we’ve lost about $22 billion. But $5 billion for public education, and $6 billion for public services. And so we need to address structural issues from the state. We definitely need to do that. And we are taking action in that way. But we also need to address the priorities of LAUSD. And again, instead of using their reserves in the classroom- and they also are not addressing the charter school issue of $600 million loss every year because of loss of students through charter schools. They need to attract and retain educators, and need our students to be interested in coming to LAUSD. That’s why one of our proposals is community schools and that’s to invest $25 million into schools at the community where the parents, the educators, the students have a say in a full curriculum, and that will also have wraparound services to meet social emotional needs. But the arts and the music, these are things that our parents want. They want lower class sizes. That’s why they say they go to charter schools. So if we invest in our community, invest in our local schools, that’s what will make this district thrive. That’s what will bring dollars back into the school system. And that’s what we need to do. MARC STEINER: So very quickly here, a couple things we really need to touch on before we conclude our conversation together today. And I want to- talk a bit about charter schools and how they work in Los Angeles. Because they’re different all across the nation. Here in Baltimore, where we have charter schools, and in Maryland, you can’t have a private company owning and running a school completely. It has to be- it’s a different process. And it has to be nonprofit, as well. So how does it work in the Los Angeles charter schools? Does it take money away from the community schools and traditional schools? What is the bottom line between charter schools and other schools in your community? Well, we have had a 287 percent growth of charter schools in the past ten years. And again, it’s a $600 million loss every single year. The money from the state follows the student. So when you have a student leave the public schools to go to a charter school, we lose that money. And even if they come back to us, which in many cases they do, because sometimes they get discouraged from staying there, because maybe their test scores weren’t as high as they should be, or that they have special needs. They encourage all special ed, especially severe kids are are not encouraged to go to charter schools. They want them to come back to LA Unified schools. So we have already lost the money for that year, and we still have the same overhead in terms of building costs and costs to run schools. So yes, that’s why our schools suffer when we have charter schools. And we also have colocation, which means that if the charter schools sees unused rooms, rooms that are not used by classroom teachers, they can ask for those rooms and actually come into the public school, and have, like, segregated schools. Another school within the public school where they can have their charter school. And sometimes this kicks out the music teacher, the adapted P.E. teacher, and many other resources. They take over the complete computer lab or the auditorium. We’ve heard all kinds of stories like that. So it’s an unequal system because they’re unaccountable, and they don’t have to meet the same standards as public schools. MARC STEINER: So very quickly, the evaluation piece on teachers seems to be one of the major sticking points here. Let’s talk a bit about that, about the differences between how the district wants to see teachers evaluated, and how you want to see teachers evaluated as a union. MARC STEINER: Oh, really? OK. I thought it was. From my reading it appeared that that was a huge gap. MARC STEINER: Buettner is the head of the school district, correct? ARLENE INOUYE: He is the superintendent, a Wall Street banker who has no educational experience, who’s been having secret meetings and not inviting the public, kicking out our own people, our educators and parents, into his meetings. MARC STEINER: So finally, I don’t know if you’re a betting woman or not, but where do you think the likelihood of a strike is in LA? ARLENE INOUYE: Well, what I can say is that we have to go through a certain process, and we will abide by the law. The union will abide by that law. So we are in mediation. We went one day for mediation, and we have no agreement. So we’re going for a second day. We want to get an agreement. But if we do not, we will be then released to go to factfinding. And at factfinding there is a panel. They will hear both sides, write a report, and then issue a recommendation that’s nonbinding. And from that point, we could go on a legal strike. So unless the district addresses the critical issues- we’re talking about saving public education. Because at the rate of the charter school growth, at the rate of the defunding that Buettner wants to do- by the way, he also says we’re 17 percent overpaid, our health benefits are 44 percent too generous. He wants to add more work time and more requirements to get our pay. Unless we turn that around, we will not have a public school district. That’s what the union’s saying. This is a crisis. This is a critical point in our history. That we need to start investing in public schools. We need to support our educators and parents. And we need to have the school system that we know that we can have. We call it Schools LA students deserve. MARC STEINER: Well, Arlene Inouye, this is a fascinating conversation. I appreciate you taking the time. Good luck. We look forward to talking to you again and see how this comes out. Good luck to our students, and teachers, and schools in LA. Thanks for joining us. ARLENE INOUYE: Thank you so much, Marc. MARC STEINER: And I’m Marc Steiner here for The Real News Network. We’ll keep on top of this for all of us. Take care. Thanks for tuning in.